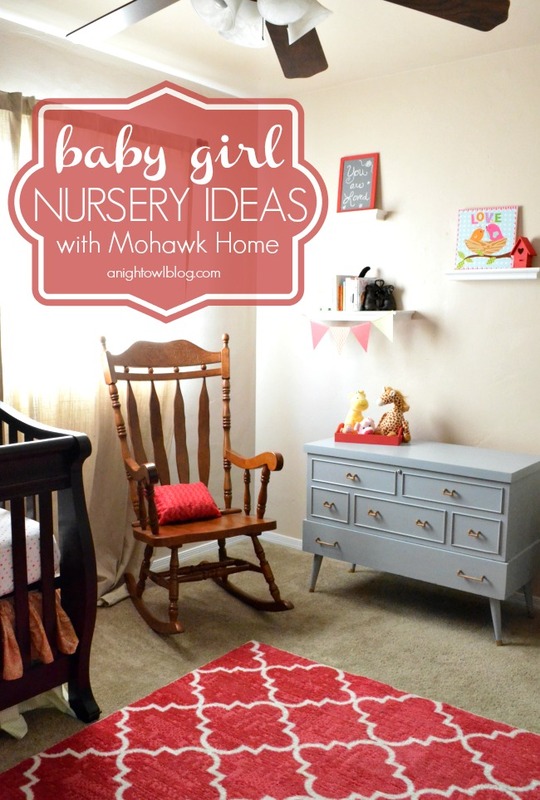 Thank you to Mohawk Home for sponsoring this post today on Baby Girl Nursery Ideas and Mohawk Home Area Rugs. Hi friends! I am so excited to finally share this room with you! 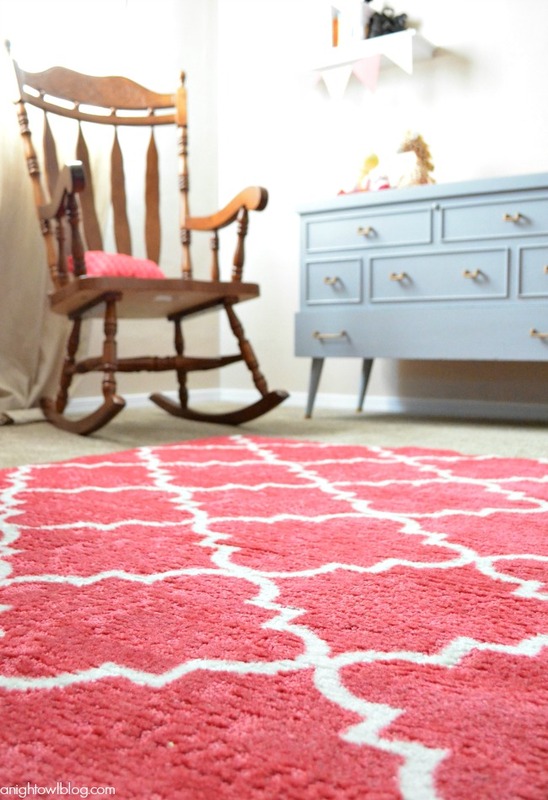 A couple of months ago, the lovely folks at Mohawk Home provided my friend Ambre with this Fancy Trellis Hot Pink Area Rug for her baby girl’s nursery. Be sure to stay tuned til the end where we’re also giving one of these fabulous rugs away! What I love about this room is that it is clean and simple, sprinkled with meaningful trinkets, and pulled together by this gorgeous rug. 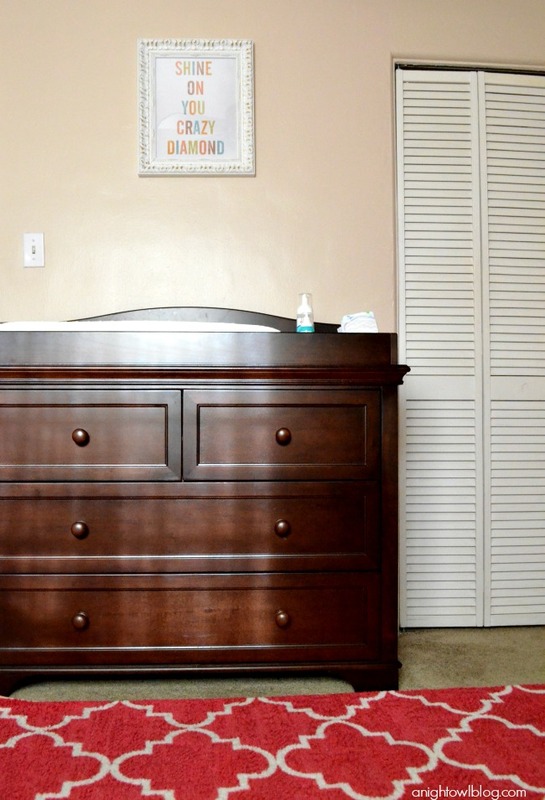 Ambre let me take over the room for a bit so that I could share some pictures and baby girl nursery ideas with YOU! I love that Ambre picked colors for her baby girl’s room that aren’t necessarily “girly.” Don’t get me wrong, is definitely a fair share of pink (including the rug), but you’ll also find blue, green and orange! Such a fun combination. And I feel like the Fancy Trellis in Hot Pink is really what ties it all together. We mixed paint to match the color of the rug, and made sure to add touches of it throughout the room. One of my favorite pieces of the room is this gorgeous trunk that Ambre’s father restored for her. Not only is it simply stunning and functional (there is so much storage room inside! 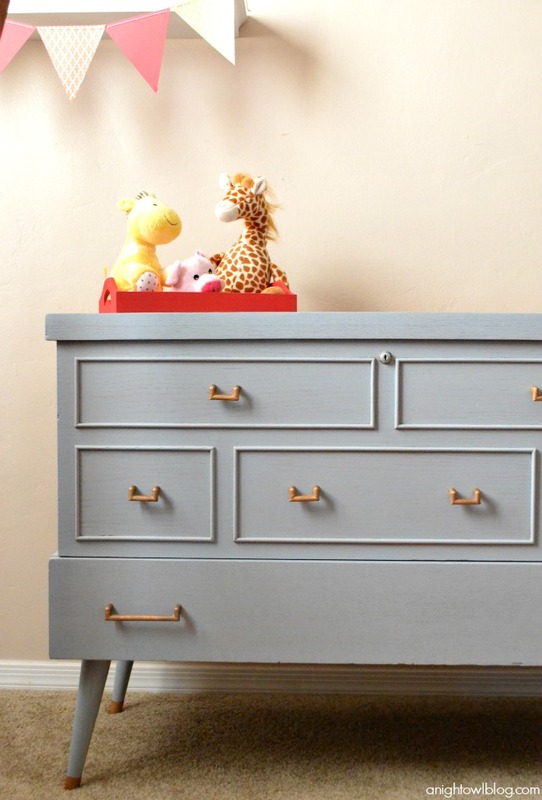 ), but it is sentimental because all of the love and work that went into updating it for the nursery. 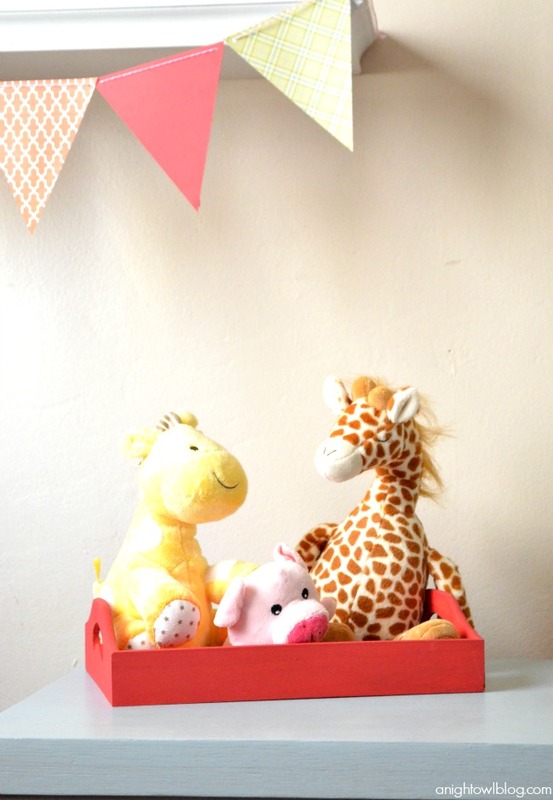 We painted a small tray to hold baby girl’s stuffed animals to place on top. The tray really could hold anything! It’s cute, adds more of the Hot Pink Trellis color to the room and is functional. We also added hints of the Hot Pink Trellis to the room and tied in the other blues, greens and oranges by making some fun bunting! Here we hung it off a cute little shelf holding baby girl’s sweet little books. 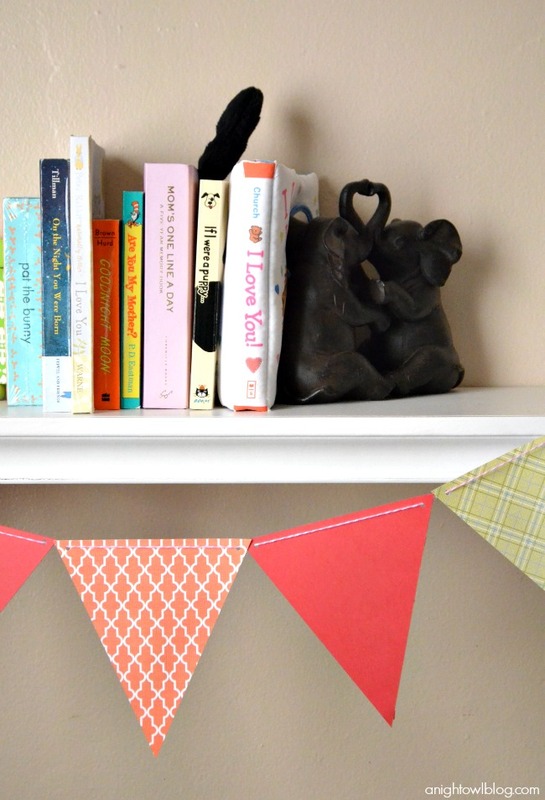 We also added more bunting on the other side of the room to add a little more fun and whimsy. Ambre also had a cute little love nest print that we incorporated by adding a small birdhouse painted to match the rug. So cute! I honestly love the idea of birdnests in a nursery! I think a whole theme could be built around them (and probably has!). We also snagged a large monogram H from Joann’s and painted it to match the rug. Don’t you just love monograms? This large one is perfect right above the crib. 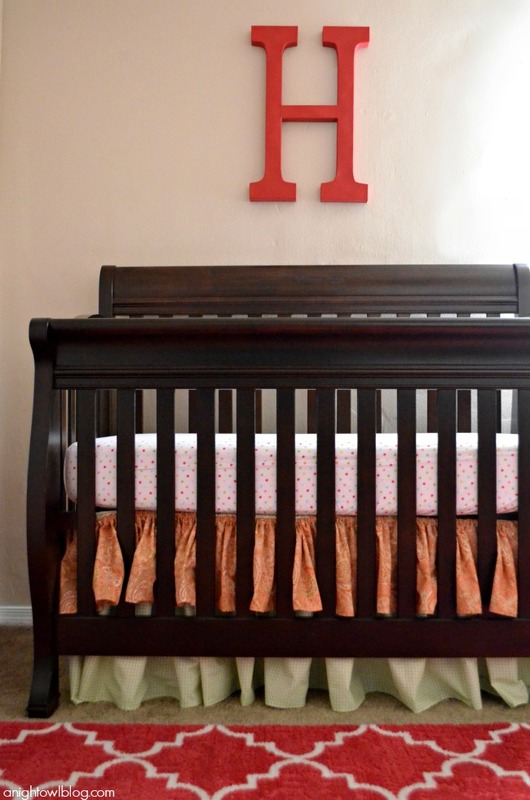 I am one of those who loves the baby’s name or initials in the room. Here you can see how the Fancy Trellis in Hot Pink coordinates with the other colors in the room. This beautiful bedskirt was handmade with coordinating orange and green fabric. I love how the rug brings out the red and pink from the orange fabric! And last but not least, above the changing table, Ambre added this sweet art print “Shine on you crazy diamond.” Perfect for a little girl, don’t you think? So I simply adore how the room came together for Ambre – and really at the center of it all was the Mohawk Home Fancy Trellis Hot Pink Area Rug! For such a cute, eclectic room, it is really important to have one design element to pull it all together, and for this baby girl nursery, it was all about the rug! 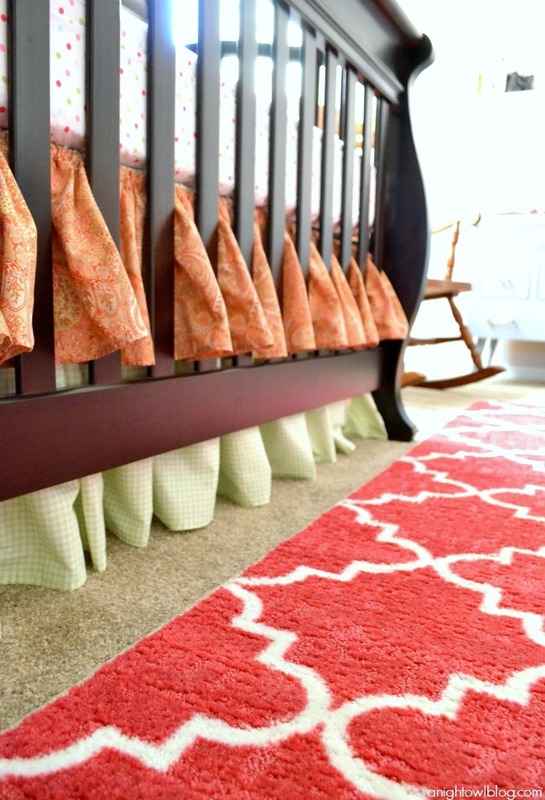 And the rug will be able to grow with baby girl, even if the room or the style changes. The quality is fantastic, the design classic and timeless. What room in your home could be transformed by a Mohawk Area Rug? 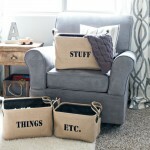 You can find them at a number of fine retailers such as Kohl’s, Home Depot, Lowe’s, Target and JCP! But lucky you! 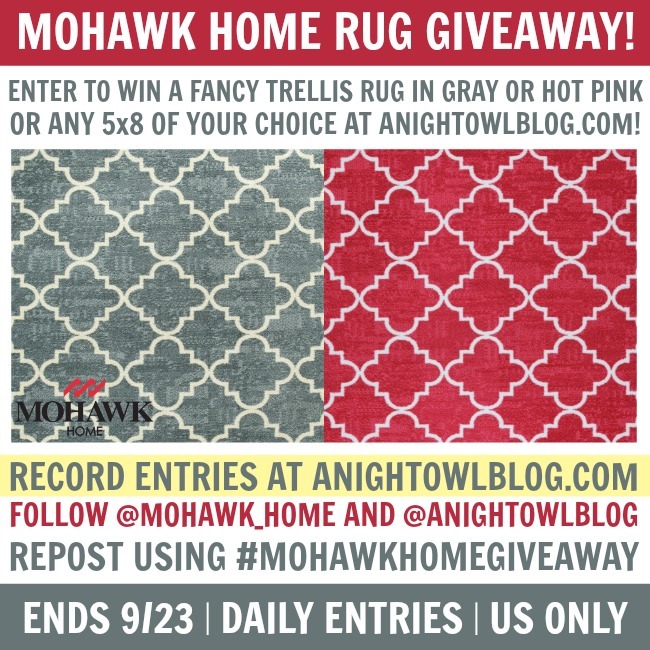 Today we’re giving away this fabulous Fancy Trellis rug in Hot Pink or Gray, or any 5×8 Mohawk Home area rug of your choice (up to $150 value)! US only. Ends 9/. Good luck! 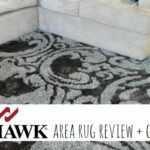 Disclosure: Thank you to Mohawk Home for sponsoring this post today on Baby Girl Nursery Ideas and Mohawk Home Area Rugs. TERMS & CONDITIONS: Giveaway is open to US residents ages 18 and over and ends at 11:59 ET on September 23, 2013. By entering you give the right to use your name and likeness. Number of entries received determines the odds of winning. Approximate retail value is $150.00. One winner will be selected. All liabilities and responsibilities with product is directly responsible by Mohawk Home. 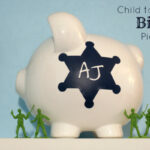 Winner will drawn by random.org from all verified entries, contacted by email provided, and announced on this page at the end of the contest. Winner has 48 hours to respond or prize will be redrawn. Entrant is responsible for the email address they provide, whether through typing it directly or through the Facebook entry method. A Night Owl is not responsible for lost or misdirected emails. All prizes will be awarded. No prize substitutions allowed. This promotion is in no way sponsored, endorsed, administered by, or associated with Facebook and we hereby release Facebook of any liability. Information is provided to A Night Owl, not to Facebook and your information is never sold or shared. Facebook is not a sponsor of this giveaway. Mohawk Home is a sponsor of this giveaway. Prize is awarded directly through Mohawk Home and requires confirmation of delivery. Protected tweets do not count as an entry method for tweeting. Tweets must come from a public account. No purchase necessary. Void where prohibited by law. Previous Post: « 50+ Caramel Recipes – Cookies, Cupcakes and More! I know exactly where I would put that gray rug if I win!!! But I also need a rug for my back porch… decisions. Thanks for the giveaway!! Oh I know, it’s so hard to choose, right? The gray one looks fantastic though! Good luck Sharon! 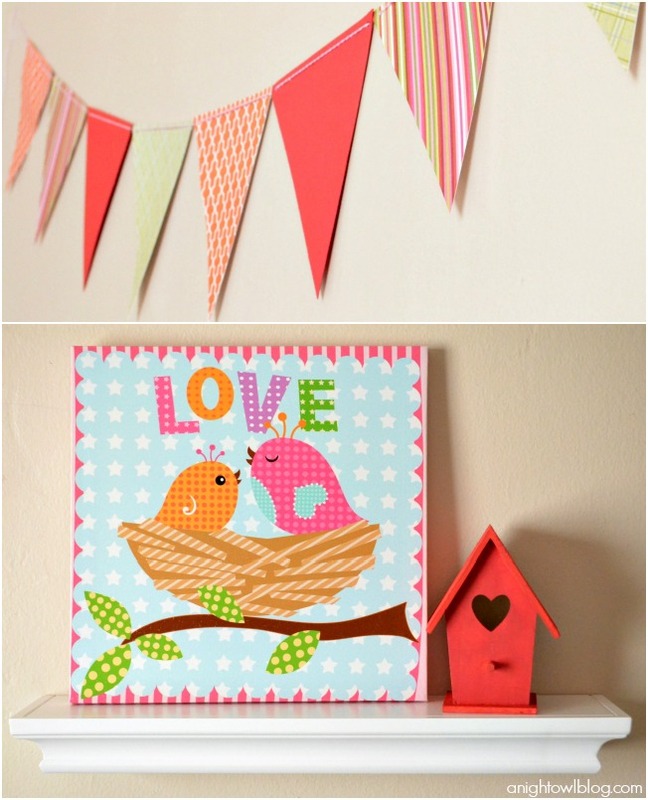 Love all of the ideas, but especially your buntings. Did you just stitch through scrapbook paper? Boy, do I have a place for that gray rug.